Art Exhibit: de Saisset Museum at Santa Clara University, California. Opening Thursday, September 22nd, 6PM. David Bacon and Francisco Dominguez have both followed in the tradition of Depression-era photographers such as Dorothea Lange, focusing their cameras on struggle, dissent, immigrants, and workers. Their photographs speak to the global character of contemporary migration. Like the so-called Okies of the Depression, many of today’s migrants have been displaced by environmental degradation and wider economic forces. The title of this exhibition refers to a sign that 1930s folk musician Woody Guthrie often had on his guitar, “This Machine Kills Fascists.” These two photographers build a powerful body of visual evidence of the continuing struggle of workers, migrants, and poor people to survive. In this exhibition the photographers responded to images by Dorothea Lange and selected photographs from their own work that draw close connections between the 1930s and today. 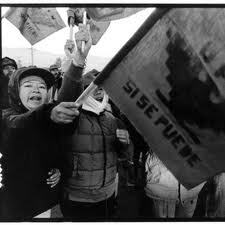 David Bacon is a photojournalist who has documented the movements of farm workers, social protest from Iraq and Mexico to the U.S., and the migration of people. He is the author of several books, and many of the images in this show are from Communities Without Borders, Images and Words from the World of Migration. Francisco Dominguez is a photographer and printmaker. His parents both were farm workers. He documents the struggles of indigenous, immigrant, and poor people in black and white photography.